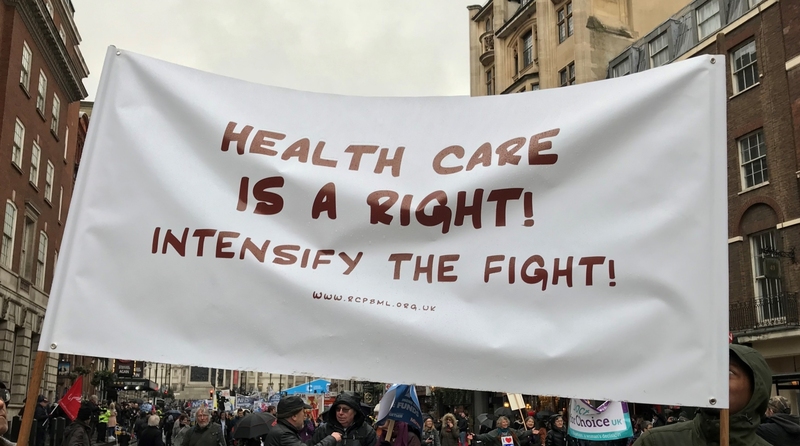 in Defence of the Right to Health Care! Today, Let Us All take a Stand, Speak Out in Defence of the Right to Health Care! 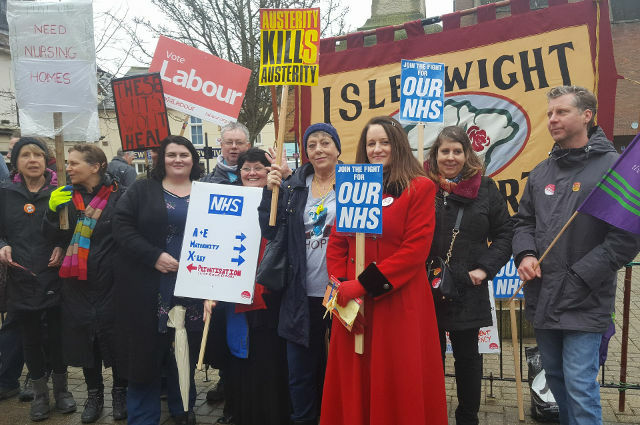 Today’s Celebration and Demonstration has been organised to show the people’s opposition to the wrecking of the NHS on the occasion of its 70th anniversary. 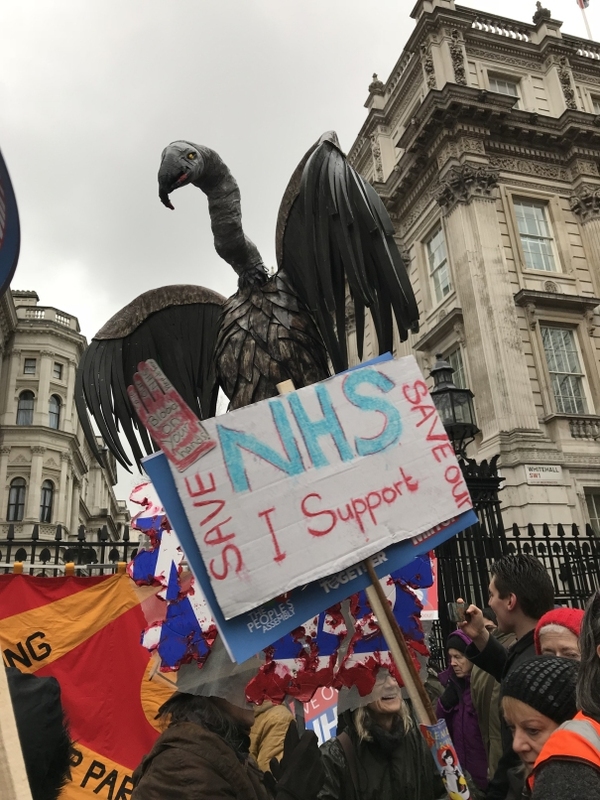 It has been organised by all those thousands of people in the community and thousands of health workers, including their trade unions and staff associations, that have been fighting to save their local health services and hospitals and safeguard the future of the NHS, in some cases over several decades. 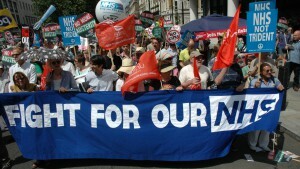 The demonstration is a celebration not just of the founding of the NHS in 1948. It is also a manifestation that people are in action today to safeguard its future. In a modern society, that future must be safeguarded on the basis that health care is a right. The claims of the people on society for all their health care needs must be granted as of right. For such a society, the promotion of good health for everyone must be a number one priority. The social welfare state as envisaged by Beveridge and Bevan has come and gone. This model of society went into serous crisis in the 1970s. With Margaret Thatcher came the promotion of the ideology of neo-liberalism, with its doctrines of privatisation and so-called “shrinking the state”. How far this has come can be seen in the so-called “internal market” in the health service that is premised on GPs, organised in Clinical Commissioning Groups, with the CCGs being run by a governing body, “purchasing” health care from the “providers” of health care. It is reported that Unite the union surveyed the 3,392 CCG board members in 2015 and reported that 513 were directors of private healthcare companies: 140 owned such businesses and 105 carried out external work for them. More than 400 CCG board members were shareholders in such companies. From a position where hospital and GP services were planned on a national basis, this market-driven backward-looking way of NHS funding has now fragmented health services. 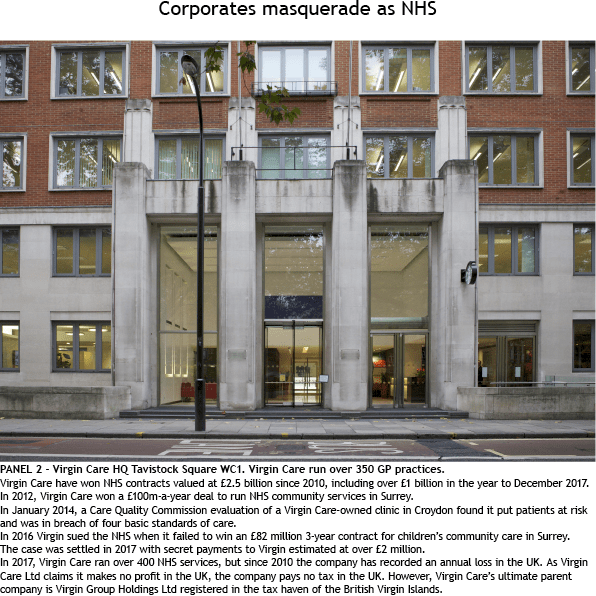 The “providers” compete with each other for patients and services as “public” Trusts and private corporations such as Virgin Health Care. Then hospitals and services are deliberately placed in deficit by those responsible for funding them by imposing “efficiency savings” and cuts. This has deepened the crisis and has already closed hundreds of vital health services and thousands of much needed hospital beds. This crisis in the way the NHS is funded can be seen in the recent statements of Theresa May claiming that her government will increase the NHS budget by £20 billion, only for “stunned military chiefs” immediately to demand that that £20 billion should be given to them for “defence” instead. This shows that government cannot reconcile the archaic tax system with the needs of the people and their well-being. The policy to say that the £20 billion should be funded by raising taxes by that amount is nothing but a pay-the-rich scam. But today all the health campaigns are coming together to say that the NHS is a vital part of the well-being of the people in a socialised economy. It is a fact that has to be recognised and not diminished to one of being a burden to the economy because the population is “ageing” and so forth. Making it a burden suggests that individuals are the problem and have to pay. This can be seen for example in the cross-party committees at Westminster that are encouraging the government to increase taxes for people over 40 for social care and so on. Today, we have to fight for a society that recognises that health workers create value in the socialised economy. The huge value they produce needs to be claimed by the government in large part from the monopolies and oligopolies that consume and profit from this value in having a healthy workforce. The crisis of NHS funding shows that the NHS cannot be reconciled with such an archaic tax system that does not claim this value. It also cannot be reconciled with the pro-war ambitions of the British ruling elite striving to retain British military interference and carry out wars of aggression with the empire-building aim of making Britain a “leading power” in the world. 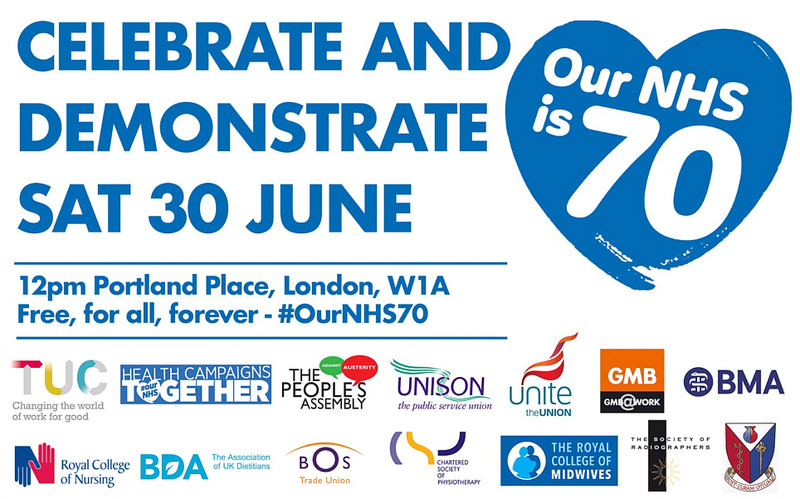 So today, in our thousands as people who are in action to safeguard the future of the NHS on its 70th anniversary let us all take a stand and speak out in defence of the right to health care. Let us step up the fight to oppose the wrecking of the health service, and fight for public oversight and for the right of health workers and professionals, and the people as a whole, to set the agenda and be empowered as the decision-makers. 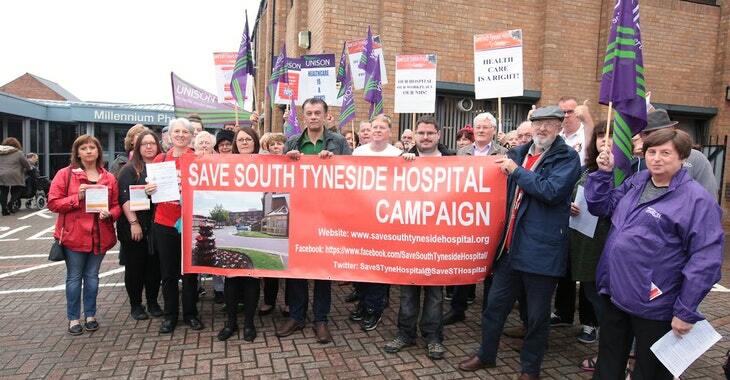 Through outsourcing of vital services at St Mary’s extensive wrecking is taking place to healthcare on the island. Around the country we know that amalgamation and hospital closures have been going on for decades. Moving facility, with the creation of “superhospitals” from existing big hospitals like Southampton, has long been the effect of centralisation. They even say that it is because of “duplication” of services, although in many instances it has meant a reduction or close-down of a service. These things are obviously not in the public interest. 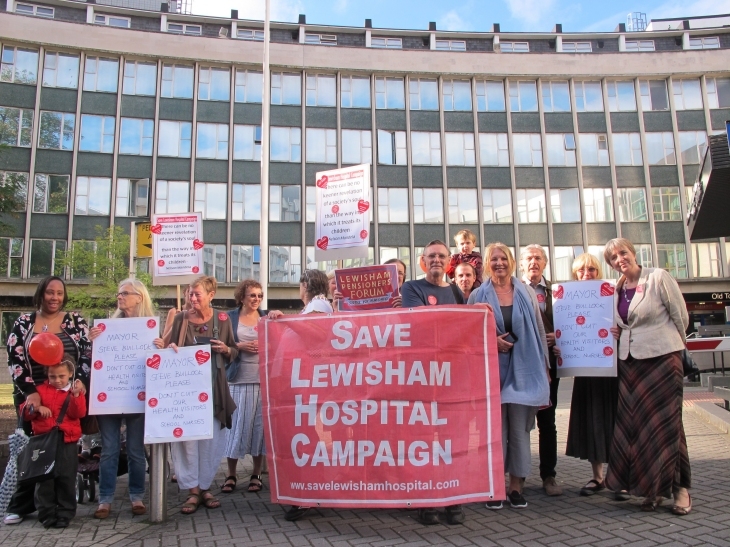 For some time, hospitals have closed wards and cut beds for “efficiency” and either reduced staff or created a situation of relative employment cuts, after which millions had to be spent. Valuable assets owned by the NHS have been sold off for a pittance. Hospitals have had to re-open wards, find new space and scratch around for beds and try to recruit staff, relying on expensive agencies. It has gone on particularly through various crises, to try and restore stability. The high costs of restructuring through the misnamed “sustainability” will never be got back. Despite community opposition, the closures and consolidations are still happening. Mergers and amalgamations are not in the public interest. They are extremely expensive, taking vital resources away from care, and they lead to the bogus centralisation of services, which are too far away for many residents. The costs are much higher than if our hospitals were properly funded locally; the hospitals are often located far from local town transportation systems. Even if there is no brand new site, facility has to be enhanced at Southampton, which incurs transportation problems from the island and beyond. Our demand is that wrecking stops, outsourcing off island and into private hands is reversed. We must bring authority and decision-making into public hands, it may require new forms of public authority of our health service. After all, the public has its interests and the privateers have theirs! Recent changes by NHS England (NHSE) divided the English NHS into 44 local health systems or “footprints” (now “Sustainability and Transformation Partnerships”). Each of these is required to integrate its local health and social care services through crossboundary working and pooled budgets. These changes, relying on collaboration between healthcare providers within a “footprint”, currently run counter to the Health and Social Care Act of 2012, which sought to increase competition. Now, further developments in 2017 mean that ST Partnerships are required to deliver “accountable care” by morphing into Accountable Care Systems (ACSs), with the aim of eventually becoming Accountable Care Organisations (ACOs). ACOs are non-NHS bodies, “designated” by NHSE, despite the absence of any statutory authority. Behind the rhetoric of replacing competition with collaboration, NHSE intends to substitute the current system of procurement with one inviting tenders for a single, long-term lead ACO contractor for each region, empowered to decide both the location and nature of services. These developments are influenced by thinking from the World Economic Forum (WEF) that favours governments cutting back on public services and giving corporations a greater role. The WEF argues that the costs of national health systems like the NHS can be reduced by introducing new models of care – accountable care systems – that “integrate” services, reduce hospital capacity and expect individuals to provide more “self-care”. NHSE argues that introducing “accountable” or “integrated” care is central to Government aims for the “financial sustainability” of the NHS. In this context, “sustainability” means reducing services to match insufficient funding. Despite being one of the richest countries in the EU, GDP spending on health care per person in the UK is below EU-15 averages. They increase the potential scope of NHS privatisation by new procurement arrangements that will be highly attractive to multinational corporations: ACOs will have a single, long-term contract to commission and provide health (and possibly social care) services for an entire region. While NHS costs will continue to rise by around £22 billion by 2020 (compared with 2015 levels), accountable care systems will enforce an unprecedented real terms freeze in spending. 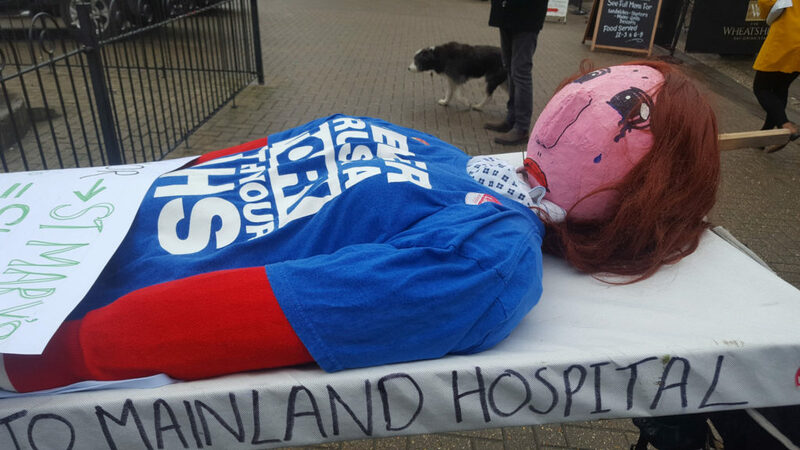 They will transfer the NHS”s funding shortfall to new local, self-contained areas and, as a consequence, they will compound health inequalities and regional variation in health provision. They rely on “transforming” the NHS workforce, replacing experienced clinicians such as doctors and nurses with technologies, while introducing new, lower skilled roles, such as physician and nurse associates. ACOs are likely to underdeliver required skill levels and undermine NHS terms and conditions of employment. No one can deny that acute, primary care and community NHS services and social care need to be better coordinated. However, this does not require commercial contracts and the involvement of corporations. 4: There have not been actual cuts in total NHS funding since 2010 – funding has risen very slightly in cash terms. However, the rise has been far slower than the growth of population need and cost pressures. £22bn is the gap between the virtually frozen funding for 2015-2020 and the steadily rising costs and pressures, and that implies “savings” which must amount to cuts.